I made it to Florence and will be bopping around Europe for the next few days! As you know I have always been a print on print (plus some more print fan) so when I found all these pieces I knew they were made for each other. Shop the full look below and follow along on instagram this week for all my adventures! Pants: Reformation (also love these Reformation jeans and this dress). Top: Storets. Bag: Mansur Gavriel (also love it in the circle bag here). Shoes: Madewell (from last year as seen here, here and here – yes I wear them too much). Woven bag: Dragon Diffusion. Scarf: Club Monaco. Great post! This look is gorgeous, and i love the bold gingham print. I can’t wait to see more Europe posts! I love the set of clothes you’re wearing, it’s a pattern that never goes out of style! Also, I really like the scarf that is in your hair, looks very cute. I’ve never been to Florence, but it’s one of my dream destinations! I am eagerly waiting for more posts about your exciting journey through Europe. Enjoy the art, sunshine & wine! Safe travels. Love the fun hair scarf and those sunglasses! Love this outfit! 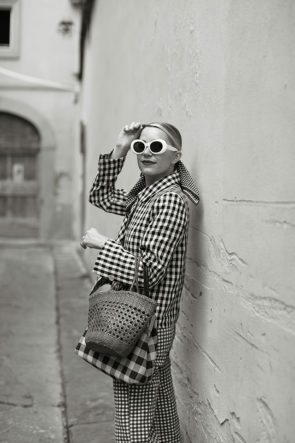 I’m a huge black and white combo fan and gingham is a classic print that never goes out of style. The awesome sunglasses finish the look. I always admire people who are capable of wearing a full outfit of one print, for I feel that it would look like too much or slightly hypnotizing. However here, it really works and I think that’s because of all the different sizes of the print and the level of pigmentation from each. This way you can clearly see the different from the pants, jacket, bag and each plays an important role in bringing the outfit together! I love all the black and white gigham pieces worn together. It’s almost like a monochrome look, but with a print. Oh Florence. I’ve always wanted to go there! I love how you paired the multiple sized gingham pieces! SO pretty! Rocking the gingham on gingham look! This print is just stunning. So inspiring outfit dear! Loving this whole gingham look! Stunning photos! A lot of gingham but you styled it very nicely! Gah, this makes me miss being in Italy so much. You look like chic 60’s model here. love! Absolutely incredible! You are always stylish, but this outfit is very special. I love gingham but this look is all another level of gingham! Gorgeous! This outfit is super cute! I love it! This look is what I call accidental chic . What I mean by that is it has a carefree chic style . This one of my favorite looks you have done . Such fabulous style , thanks for the thrill .